Israel was expected to issue a statement later in the day. 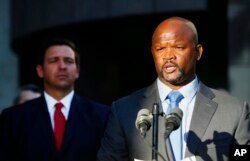 Acting sheriff Gregory Tony, right, speaks after being introduced by Florida Gov. Ron DeSantis, left, at the Broward County Sheriff's Office Fort Lauderdale headquarters in Florida, Jan. 11, 2019. FILE - Then-Broward County Sheriff's Deputy Scot Peterson, who was assigned to Marjory Stoneman Douglas High School during the Feb. 14, 2018 shooting, is seen in this still image captured from the school surveillance video released by Broward County Sheriff's Office in Florida, March 15, 2018.